Is there anything better than a bowl of warm soup on a cold winter's day? I don't think so. 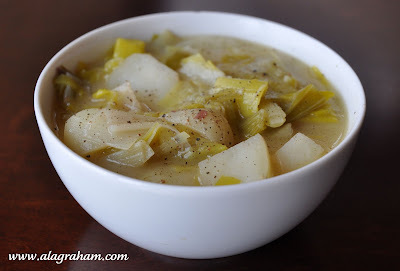 Here is a recipe for a hearty, sweet, oniony flavored soup that is simply delicious! 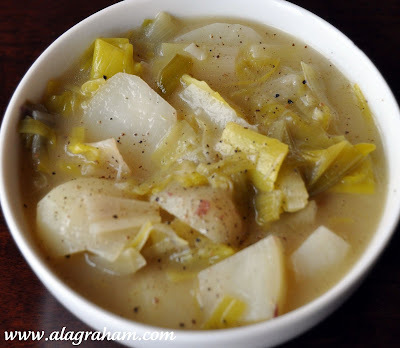 I have seen other potato and leek soup recipes that call for pureeing the vegetables but I really like biting into the pieces of potato and leeks in this 'rustic' version. 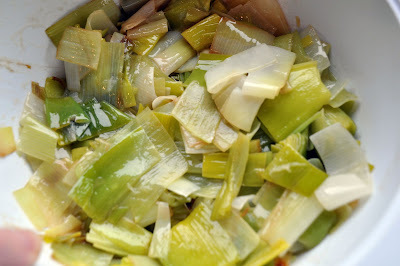 Melt butter in a Dutch oven over medium heat and add the leeks. 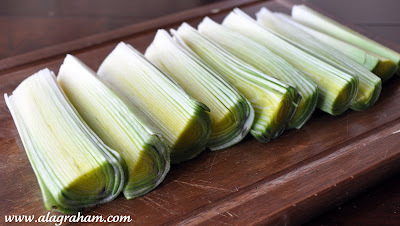 Cover and cook, stirring occasionally, until the leeks are tender, about 15 minutes. Add the flour and stir until everything is combined. Gradually add chicken broth while whisking. Add potatoes pieces and bay leaf. Bring soup up to a boil. Once boiling reduce to a simmer. Cover the Dutch oven and simmer the soup for about 7 minutes. Now completely turn off heat and let everything sit covered for about 15 more minutes. The potatoes should be perfectly tender, not mushy and not hard. Discard bay leaf. Season the soup with salt and pepper. Soup can be refrigerated for about 3 days. Excellent! 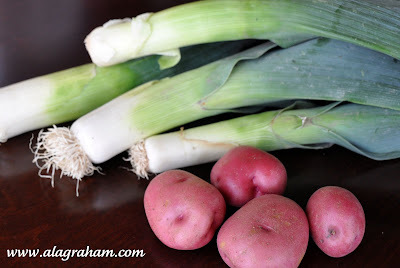 I had potato leek soup on my list for next week and I am going to try this recipe. Looking forward to a bowl of this. I will to try this, fantastic!! I like so much red potatos and leeks. ...Your soup is delicious!!!! I make this soup often, but I have never thought of leaving the chunks in it. I can't imagine why not--what a great idea! Next time I make it I'm going to leave it chunky. Thanks! I'm with you on chunky soups. It can be nice to have pureed soup, but for the most part I prefer chunky! Looks delicious. I'm half and half-- half puree and some chunky. Potato leek soup meals spring to me. Yesterday, where I live, it was pouring rain and grey skies. Today.... sunny, and it will be in the 70's all week. So much for making soup! This is one of my faves.